We are a Broward County Alliance of community organizations and individuals aiming to abolish institutional racism, and to democratize and transform oppressive systems primarily via popular mobilizations. 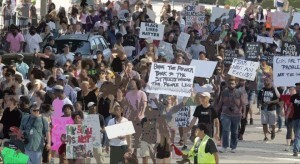 On Sunday, December 18th, Black Lives Matter Alliance Broward gathers in protest. Many people think of one thing when they think of a Black Lives Matter protest – a passionate, defiant response to a black life that was recently lost. Truthfully, it has rarely been that simple. The presidential election, and even the recent mistrials of the killers of Freddie Gray and Walter Scott, strongly imply that things may never be the same again. We are gathering once more to show solidarity with the living. One of the most inspiring things the Alliance has introduced people to this year is jail solidarity. Therefore, we’re marching one more time on Broward County Jail to hold a noise demo for those inside. We’re advocating for Dayonte Resiles, a young black man who the State Attorney’s Office is trying to execute on shaky evidence. For Tyler Shuman, who is being charged with 2nd degree murder over the officer-involved shooting death of his friend, Michael Wilson. As the Sun Sentinel recently reported, there are far more people suffering inside the Broward Count Jail system than anyone acknowledges, and we demand the rights of the thousands of people caught in this system be protected. Well before this report, 2 friends of ours were badly brutalized by Broward Main Jail guards this year alone. We will march and make some noise to end mass incarceration in Broward County. We are gathering to unite with those resisting the worsening white supremacist police state. The incoming regime is set to worsen racial and economic inequality, to attack our civil liberties, healthcare, education, environmental protection, and so much more. Hate crimes have already skyrocketed in the past month, and even in “liberal” Broward County, recent incidents have people worried. The Alliance has stood with victims of racist attacks for some time now and will continue to do so. For those opposed to Trump, we invite you to join the Alliance, but in doing so, to meet us at least halfway – we must remember that the “passive” white supremacist police state of the Obama regime is what got us to where we are today, and we do not seek a return to that status quo, or any other that system that asks us to ignore the racial and economic injustice across our nation in exchange for a few liberal social reforms. The Alliance also stands in solidarity with the Water Protectors of Standing Rock, and we encourage those inspired locally by this movement to join us. The battle for indigenous autonomy, environmental protection, and against the militarized police state, must be fought here and everywhere. We gather for black lives lost, yes – but we also organize for more than something that can be described in a single protest chant. For 2 years now, #BLM954 has led a rising tide of activism in Broward County that changed the way people here think about protest. That tide continues to rise, even as the dynamics change rapidly. We look forward to a near future where those imperiled by the US government have their own resistance movements and alliances – movements of those at risk due to racist mob mentalities, immigration policies, healthcare cuts, corporate exploitation, and so on. We will rise together. Join us at Huzienga Park at 5 pm on Sunday, December 18th, let’s make some noise.